It's taken me two visits to the theater before my thoughts have settled enough about The Dark Knight Rises to articulate them. So what did I think of this, the final installment of Christopher Nolan's take on Batman? 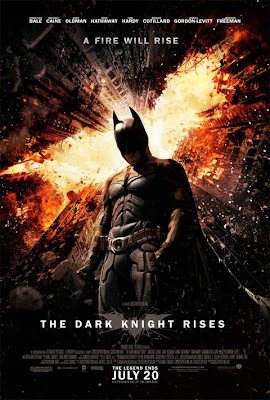 The Dark Knight Rises is the capstone of what is, to date, the definitive Batman film saga. It is not however, the definitive Batman on film. There are some issues that I have come to have about Nolan's "Dark Knight Legend" series (if that's not the official title of this trilogy then it should be). Most of that has to do with what I came out of Batman Begins in 2005 expecting to see from this Batman franchise. If any single movie has come close to being the be-all, end-all Batman movie, then Batman Begins is it in my book. More so even than The Dark Knight (a film that I could not bring myself to review four years ago for a number of personal reasons, for those who have openly asked about it). Think back to that final scene of Batman Begins. Jim Gordon asking Batman about "escalation". How the police would buy semi-automatics and the criminals respond with automatics, and then with Kevlar-piercing rounds against the cops' bullet-proof vests. So what was going to happen in the wake of a costumed vigilante "wearing a mask, jumping off rooftops"? In Batman Begins we saw Gotham City in the grip of organized crime. And that's how it was throughout most of The Dark Knight. In fact, the mob's presence in Gotham was more pronounced in the second film. And then the Joker came out of nowhere and single-handedly did more to destroy organized crime's hold on Gotham than all the efforts of Batman, the Gotham City Police and the city government combined. "This town deserves a better class of criminal," the Joker told the Chechen before feeding him to the dogs, "and I'm gonna give it to them." The era of the mob had ended. The time of the freaks had come to Gotham. And as the Joker put it, Batman was responsible for it all. "There's no going back. You’ve changed things, forever." That's what I wanted to see. Escalation. And with The Dark Knight Rises we still haven’t seen it in a Batman film series. I've a theory. I can't prove it, and I'm not inclined to pursue it past my gray matter. I think that Christopher Nolan and his team did want to show us that escalation. And they might have, except for the very untimely death of Heath Ledger. That had to have thrown whatever plans there were for this film series into complete chaos. Because let's face it: Ledger's Joker was absolutely one of the greatest villains in movie history and whatever else would follow could never escape the shadow that Ledger had cast. I think that Batman Begins and The Dark Knight loaded the powderkeg and had the fuse ready to blow. But Nolan couldn't bring himself to light it in the wake of Ledger's passing. Not that anyone could blame him. So Christopher Nolan didn't bring me the vision of Batman that I had expected. But I think that he did finish his vision of Batman as best he could. And he wound up giving us all something that we've never had before, until now: a true superheroic legend about beginnings, failings, and ultimate redemption. It's not the definitive vision of Batman on film. That movie hasn't been made yet. It may never be made. But with The Dark Knight Rises I do believe that Nolan has come closer to that than anyone has ever before, and closer than anyone will for a long time to come. And the more that I think about it, the more that Nolan's Batman series feels like one massive motion picture epic, saying everything that Nolan wanted to show us about his perspective of Batman. The Dark Knight Legend trilogy is just that. One legend about Batman. Legends are malleable, protean, peculiar to the times of their telling. One can accept or reject them as one chooses, and it neither adds or takes away from the fortitude of the character itself. The film opens eight years after the Joker's rampage in The Dark Knight. Gotham City is enjoying the most peace it's had in decades. But it's the peace of a lie, and Commissioner Gordon (Gary Oldman, easily the finest actor ever to have the role) knows it. The truth – that Harvey Dent committed all of those murders and that Batman took the fall for Dent's crimes – has been consuming Gordon from within this entire time. He wants the city to know the truth, regardless of the "success" of the Dent Act enacted after the death of what Gotham believes was its true white knight. It has also been eight years since the last recorded sighting of the Batman. Bruce Wayne (Christian Bale) has retreated as much into his own self-pity as he has into the depths of the rebuilt Wayne Manor. With Batman hunted by the police, Bruce seemed to have nothing left but his grief over the death of Rachel Dawes. And despite the attempted encouragement of Alfred (once more magnificently portrayed by Michael Caine) Bruce has wasted away emotionally... and physically. He walks with a cane. A later visit to a hospital shows us that his body is a wreck. It seems that Bruce Wayne has no more motivation beyond ending his days as a recluse. It takes the intrusion of cat-burglar Selena Kyle (Anne Hathaway, who turned out better in the part than I had anticipated) to begin breaking Bruce out of his shell. Following her brazen theft of his mother's pearls, Bruce begins investigating Selena, as does Gordon. The latter's search for a missing congressman leads Gordon to be captured by soldiers of an underground army. An army commanded by the international terrorist known only as Bane. Let's address the obvious. There was no way that any antagonist could eclipse Heath Ledger's Joker. Christopher Nolan knew that. So he didn't even try. Instead in The Dark Knight Rises we get Bane and in this blogger's opinion, Tom Hardy as Bane has become an immensely more powerful foe. Not "better" than the Joker, but certainly different in all the best possible ways. We've never seen a cinematic Batman face an enemy this brutal, this cunning, this intelligent... and this sane. Hardy's Bane isn't mad by a longshot. He has a plan. He has the mind and the resources to pull it off. And to top it all off he has the raw muscle that Batman has never met in a contest. "Bane: born and raised in Hell on Earth", Alfred tells Bruce. Part revolutionary and part cult leader. A man reputed to have been drummed out of the League of Shadows by Ra's al Ghul himself. And for whatever reason following the Batman's spectacular return to the public eye, Bruce decides that he is the only one who can stop Bane. I don't think that it's the pleading of police officer John Blake (Joseph Gordon-Levitt, in a part that I thought was the best surprise of the film) that brings Bruce to don the cowl again. It's more like an irrational sense of duty, or perhaps hubris, that sends Batman to search for Bane. And if you haven't seen The Dark Knight Rises yet but are familiar with the "Knightfall" storyline that ran in the Batman comics in 1993, well... you won't be disappointed. Yes, we see it happen. You know what I mean. It's not as wracked with carnage as I would have liked but Bane does the job: breaking Bruce in body before doing likewise to his spirit by sending him to languish halfway around the world in the worst prison imaginable while watching Bane's plan for Gotham unfold via television. And what a plan it is: promising "liberation" to the people of Gotham City after cutting the whole town off from the rest of the world. Any attempt at escape will bring about nuclear destruction (a threat made in glorious fashion at a football game, in what may go down as one of the more classic scenes in cinema lore). I'll sum up what the story of The Dark Knight Rises meant to me without going any further for sake of possible spoilers: this is a movie not about Batman, but about Bruce Wayne. About how a man gets beaten down but makes himself rise again (figuratively and literally). It's about how Bruce Wayne... or any person for that matter... has to confront the night before finding the morning. And in the end, it is about how the hero not only should finish, but also that he should know how to finish. Again, it's not the definitive Batman movie. But The Dark Knight Rises is most definitely the best possible finale for what is, for the time being anyway, the definitive Batman film series. I am certainly satisfied with it. Is it a perfect movie? No. Problems and plot-holes abound. I just can't see Alfred ever, ever leaving Bruce's side, as happens in The Dark Knight Rises... but if he ever did I also can't imagine it not having the load of emotion that Michael Caine poured into that scene. I can't figure out for the life of me how Bane – a terrorist in the CIA database – can just flit off to the Mid-East and back to Gotham without apparently popping up on anybody's radar, especially with a captive like Bruce Wayne. Also: in a city of twelve million people you'd think that someone would have a sniper rifle to take Bane out from long distance, right? But you know what? I'm going to let that all slide. Because those are just minor bumps in the road on the way to that very final shot of Bruce Wayne. Longtime Batman readers will delight – and have been delighting no doubt – at the references in this movie. The plot draws heavily from "Knightfall" obviously, but also from "No Man's Land" and Frank Miller's The Dark Knight Returns graphic novel. I chuckled quite a bit at one humorous bit that's certainly borrowed from Kingdom Come by Mark Waid and Alex Ross. But more classical readers will also observe that Christopher Nolan, his brother Jonathan and fellow scribe David S. Goyer found heavy inspiration from A Tale of Two Cities. Indeed, pay attention to what Bane is doing with his hands during that first sentencing hearing. Just something I caught the second time I watched the movie, and I have to note how much I appreciated that nod. Rounding out the cast are Morgan Freeman once again as Lucius Fox (I've thought ever since Batman Begins that Freeman's Fox is one of the strong points of Nolan's trilogy) and Marion Cottilard (previously seen in Nolan's Inception) as Miranda Tate. There is also a somewhat startling return of Cillian Murphy as Dr. Jonathan Crane/Scarecrow: the first time in Batman film history that an actor has returned to play a villain three times. Football fans will also spot several members of the Pittsburgh Steelers (does Hines Ward have the craziest touchdown ever, or what?). In terms of the film's orchestral soundtrack, I think that Hans Zimmer did an amazing job. James Newton Howard didn't collaborate on this score as he did with Zimmer during the previous two films, and there is some noticeable absence of the quieter, more emotional strains that Howard helped to bring. But for what The Dark Knight Rises delivers, I think Zimmer did well. Bane's theme is growing on me a lot. It's not the "razor blades on violin strings" (literally) that we heard in The Dark Knight: those two long drawn-out notes that whenever you heard you knew that Joker was about to "get it real". Bane's is all about blunt-force trauma bringing the pain. But two pieces in particular keep standing out in my mind: the music during Bruce's rise, and the elegy-turned-triumphant accompanying the film's finale. The score is available on iTunes and in stores. It's gotten a lot of play in my office and car lately. Wally Pfister again demonstrates how he is probably the most crazy good cinematographer in the business. It's amazing enough already but when Bane brings Gotham City to its knees, prepare for some of the most amazing shots you'll ever behold with mortal peepers. Pfister's camerawork brings an epic, sprawling feel to a movie that's been uncommon since the days of David Lean and Cecil B. DeMille. For a film about a comic book hero it's especially fresh, even startling. I don't think that there's anything overtly or covertly political about The Dark Knight Rises, as some have claimed and like many perceived in The Dark Knight (the whole nonsense about how Batman was supposed to represent George W. Bush in that movie was some of the most ridiculous conjecturing that I've ever read). Nolan has disavowed there being any political metaphor, and I have to take him at his word. I will say however that to me personally, The Dark Knight Rises presents the perfect analogy of modern America. This is indeed a country held captive by madmen preaching "liberation", try to set us against ourselves in the name of "fairness" and present false hope... when what they really want is to exploit us and destroy us. Try to stand against them and you get thrown into the metaphorical "Pit", out of sight and out of mind. The more I think about it, the more I'm convinced that Christopher Nolan has crafted a cautionary tale for our time. Just as I'm increasingly of the mind that Bane will go down as one of the most infamous – and most discussed – villains in movie history. And I'm convinced that Nolan has given us strong suggestion of the only way to respond should be, to the Banes of our real life. As Bruce Wayne says at one point in the film: "No, I'm not afraid. I'm angry." Angry enough to conquer fear... and to rise. Maybe that's what this movie does that no other Batman movie has done before. Or at least, none on their own. Because The Dark Knight Rises seamlessly interweaves with the two previous films to give us one immense motion picture. One that by this third entry's final scene, does leave the viewer feeling that it was more than just time well spent on a good movie. That there is a tremendous moral at work. "Why do we fall down?" So we can rise. And rise again. I don't see how Nolan could have accomplished that, without giving his vision of Batman an all-too-rare conclusion of a saga. It was a gamble. I think it paid off, and paid off well. So lemme be succinct: I think that The Dark Knight Rise isn't the be-all, end-all Batman movie that I have always dreamed of seeing. I don't even know if such a thing is possible. Batman is the ideal of the human condition and I doubt anyone will ever hit that mark perfectly. But there will always be those who will strive to hit that mark, even themselves suspecting that they will fail. With The Dark Knight Rises and its predecessors, Nolan and his crew have hit closer than anyone has ever done before. And they've set a mighty high bar not only for Batman movies but for epic storytelling in film as a whole. The Dark Knight Rises isn't the Batman film that I personally expected. But it is the end of the greatest interpretation of Batman that we've seen at the movies. The Dark Knight Rises gets this blogger's highest recommendation. Go see it if you haven't. Go see it again if you have. great review Chris. Going to see it again tomorrow. Everything about this movie is just so darn epic, that I honestly couldn’t wait to just stand up, cheer my head off, and show my love for the epic trilogy that Christopher Nolan has made for me, and made for me with total love and care. Great way to say bye-bye to everybody’s favorite Bat. Nice review Chris. I have to admit I thought of that plot hole regarding Bane traveling to the hole to dump Bruce Wayne, as well as Wayne traveling back to Gotham, by thinking how much time that travel took. It's not like this hole was 20 minutes outside Gotham. How'd they get back to Gotham so fast? LOL! Also, I cried when the football stadium was destroyed... mainly because I love the game of football so much. Ha! Great review, Chris! Enjoyed it immensely.